The team are on the Isle of Wight, where Matt Baker strolls along the oldest pier in the UK and Ellie Harrison visits Queen Victoria and Prince Albert's private beach. Countryfile is on the Isle of Wight, where Matt Baker takes a stroll along the oldest pier in the UK - Ryde Pier. He finds out about its fascinating history and the important role it played in the rise of the seaside holiday. He also hops on board a boat to get his hands dirty helping with the pier's ongoing restoration project, working against the clock as the tide rolls in. Ellie Harrison explores the science behind the idea that a breath of fresh air is good for you, and she visits Osborne House, Queen Victoria's magnificent Isle of Wight home. She discovers Prince Albert's love for horticulture and, in particular, the trees which he planted throughout the gardens to celebrate special family occasions. Ellie also heads to Victoria and Albert's private beach, where Queen Victoria took her very first plunge into the salty depths. Former farmer and trained butcher Gareth Barlow teaches the younger generation about the virtues of eating beef. He also meets the woman who's on a campaign for people to eat beef in the week. Ahead of Remembrance Day, Adam Henson meets a young farmer putting his own take on the time-honoured classic, the poppy. And Tom Heap investigates claims that current education reforms could put school farms under threat. Matt Baker is in Ryde to celebrate the 200th anniversary of its pier - the oldest in Britain. He explores how this old timer has changed over the centuries and takes a look back at how Victorian seaside traditions, like a promenade on the seafront, influenced how we holiday today. Matt meets local boys, Vic Scovell and Tony Packer, who remember their own experiences growing up with the pier for a playground as they explain why the 1950’s was the peak of the island’s popularity. Doctors have been telling us for centuries that the great outdoors is good for our health. Ellie Harrison meets Dr William Bird who can explain the science behind the theory. She visits Bouldnor Forest where the Hampshire and Isle of Wight Wildlife Trust run woodland sessions for a range of local people, including a toddler group and people with mental health issues. Ellie discovers, first hand, how beneficial time spent in the woodlands can be. Farms in schools are a great way for students to get practical experience of horticulture and agriculture. But, as Tom Heap discovers, current education reforms have led to concerns that schools could have to scrap them. Changes to vocational qualifications and potential loss of the land management GCSE have left teachers feeling that there will be no practical courses for 14-16 year olds who are interesting in farming. But is the situation really as bad as they fear? It’s claimed that Prince Albert was the first Royal to start the tree-planting trend that continues to this day. Ellie visits Osborne House, Queen Victoria and Prince Albert’s island home, to find out more about this regal horticulturalist. She meets Toby Beasley, the head gardener, who shows her some of the more unusual methods Albert employed to ensure a landscape fit for a queen. Ellie takes a tour of the impressive grounds to see how Albert got the whole family involved in a bit of Royal gardening. This week on his farm, Adam Henson checks over and sorts out his various breeds of rare ram. Once the rams are sorted and given a clean bill of health they are put in with his ewes for the tupping season. 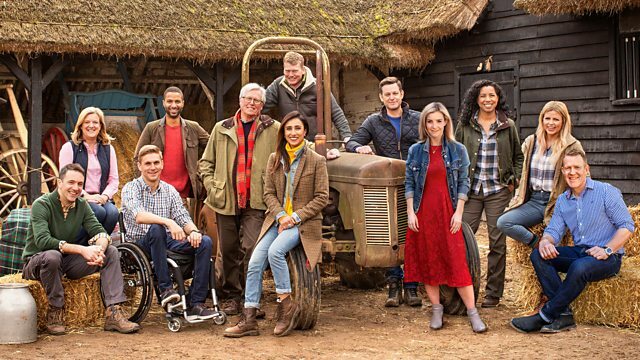 Then, as Remembrance Day approaches, Adam travels to Dartmoor in Devon to meet a family who use wool to put a different twist on the familiar paper poppy. They’re using the wool from their rare Grey Face Dartmoor sheep to create crocheted versions of this symbol of remembrance. Matt Baker has already explored the public face of Ryde Pier, now he is taking a rare look underneath it! In its 200 years Ryde has been through its fair share of maintenance work and the current work is being carried out by Trant Engineering. Its workers are repairing damage to the structure from the sea water. Matt meets some of the team that calls this most unusual, grade two listed, building site their workplace and lends a hand with some repairs. Former farmer and trained butcher Gareth Barlow has featured on Countryfile before so he was ideally placed to explore the beef industry for us . This week Gareth finds out if we know enough about traditional cuts of meat and asks if a lack of knowledge means we’re falling out of love with beef. He puts a bunch of university students to the test by asking them to identify where various cuts come from. He also meets the women farmers campaigning to get us to eat beef more often by launching their mid-week mini roast. Ellie is continuing her exploration of Queen Victoria’s Isle of Wight holiday home. As we have already discovered, Price Albert championed the great outdoors for its health giving properties. This didn’t stop at the land and sea bathing was something that he wanted all the family to participate in. Ellie visits Queen Victoria’s private beach to meet Michael Hunter, curator at Osborne House. She findfs out about the unusual contraption the Prince built to preserve his Queen’s modesty as she took to the waters. She even takes a private look inside the recently restored bathing machine.